Mix and sift cake flour, flour, granulated sugar and salt. Mix in the butter one cube at a time. Mix in eggs until clumps begin to form. Using your hands, form mixture into a single doughy mass. Add more flour if not doughy enough. Prebake the pastry shell empty at 400 degrees F. To prevent air pockets from forming bake it for 15 minutes with the beans, 15 minutes without (see How to Bake a Single Crust Pie Shell without Air Pockets), then cool. The crust should be golden brown. While the shell is cooling, make the ganache. In a sauce pan, simmer cream and add chocolate chips. Stir to melt the chips. Transfer to a heatproof mixing bowl, add butter and whip with a mixer until smooth. Pour ganache in the cooled pastry shell. Even out the top with a pastry spatula or similar kitchen utensil. Let set in and cool in refrigerator. 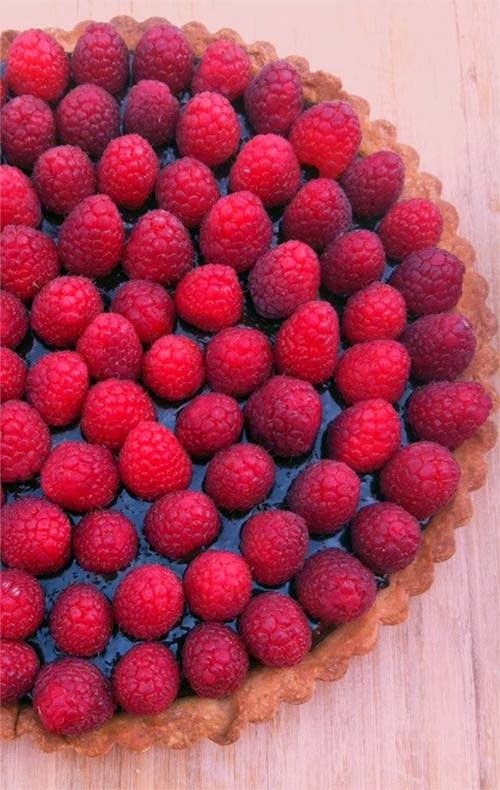 Add raspberries on top before serving. See related post on raspberry cheesecake.